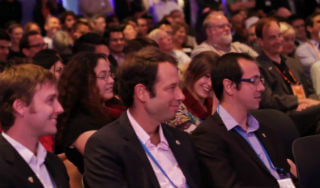 Singularity U Launches 2012 Class: Bring On The Future! Last Friday evening, I had the pleasure of attending the Closing Ceremony of the Graduate Studies Program at Singularity University (SU). This event is the pinnacle of a marathon-like 10-week program, in which 80 of the most promising and talented individuals from 36 countries have been challenged to change the world. And the students did not disappoint. Innovations in global health, emerging technologies, infrastructure, education, employment, and poverty were presented to the distinguished crowd, and no doubt many of these ideas will translate into real companies and movements in the coming years. 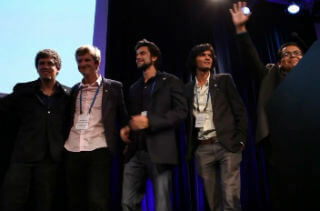 The GSP12 program launched back in June (you can watch a highlight of the Opening Ceremony here), and for almost two months, the class has experienced a crash course in innovation, with more than 160 lecturers sharing their experience and insight through intense days and long nights, including SU co-founder Ray Kurzweil. But only two weeks ago, students organized into 21 teams with the task of harnessing what they had learned to develop a core innovation that would positively impact a billion people in the next decade. At the ceremony, the teams shared their visions that showcased the power of technology to tackle the world’s grand challenges. You can find short synopses for each team innovation here. Even though the first GSP was in 2009, the first three classes of students have already produced some incredible successes. For example, Jessica Scorpio, a member of the inaugural GSP class, wanted to tackle the problem of transportation, so she co-founded Getaround, the car-sharing service that recently raised nearly $14 million is a Series A funding round. Students from GSP 2010 started Made In Space, a company that uses 3D printers to manufacture components for space in space. At GSP11, Matternet was founded, which is creating a platform to use unmanned aerial vehicles to deliver goods and aid in developing countries. With the previous GSP classes launching successful startups, it’s no wonder that students were feeling the pressure from the high expectations for this year’s class. 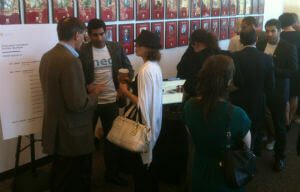 Prior to the Closing Ceremony, an expo-style display area was set up where each team had booths to discuss their projects one-on-one before everyone filed into the auditorium for the formal event. The teams presented throughout the night to a standing-room only audience while guest speakers provided insight into innovation, how to bounce back from failures, and the ways that technology can help meet the needs of people worldwide. The evening was inspiring and a great success, so it’s worth recounting in greater detail what you may have missed. Having only had roughly 2 weeks to devise core innovations that would impact one billion people in 10 years, the students took the stage in four waves to present their proposals. Witnessing the presentations was like watching Cirque du Soleil: there is amazement and awe at the performance you are a part of, because the truth is, these core innovations have the potential to shape the future today. Some of the teams had clearly thought deeply about their project and carved out attainable objectives for transitioning their ideas into reality (you can read the team descriptions here). One of these was Med Sensation, which developed a Tricorder-like glove prototype that contains numerous sensors for doctor’s to use during physical exams. Others had high aspirations for what they could achieve, such as WiFli that is aiming to connect everyone in the world to the Internet, Ubertas that is looking to build near-city offshore farms, and UrbiAnalytics, a project to use big data from the public to improve government. Another team, The Blackest Sheep, had impressively already nailed down over 100 corporate partners, including Coca-Cola. Finally, an ambitious project that is desperately needed and yet is likely to have a tough road ahead is Clinical Sense, which looks to use smartphones to improve patient enrollment, participation, and communication to improve the success and speed of clinical trials. Roberts then introduced Jack Andraka to the stage. Jack is the amazing 15-year-old recipient of the grand prize at this year’s Intel International Science and Engineering Fair for developing carbon nanotube-based diagnostic sensors that accurately detects pancreatic, ovarian, and lung cancer biomarkers and cost only 3 cents. He told the audience how he was turned down by nearly 200 professors, but one researcher gave him a chance to test his idea and after 7 months, he had a breakthrough. Jack schooled everyone in the room about the kind of perseverance and commitment that leads to innovation. Overall, in just two short hours, a whirlwind of future technologies were profiled, and it was clear that the GSP12 students have undergone a paradigm-shifting experience. Many great ideas were presented to help solve problems related to clean water, affordable food, health, unemployment, effective government, and even reducing the impact of war. Here’s hoping that many of these ideas can come to fruition, and soon.